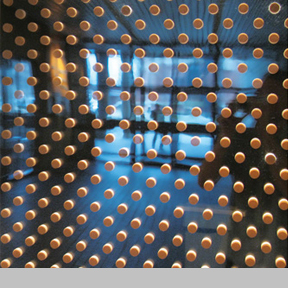 Standard ceramic fritting, a frosted graphic pattern applied to glass, is commonly used to control heat gain and modulate light in buildings, while allowing sufficient transparency for viewing. Adaptive Fritting builds on this practice with the addition of real-time dynamic motion via motorized control. While conventional fritting relies on a fixed pattern, Adaptive Fritting can control its transparency and modulate between opaque and transparent states. This performance is achieved by shifting a series of fritted glass layers so that the graphic pattern alternately aligns and diverges.